The Muslim Judicial Council (SA) held a successful awareness programme on Gender-Based Violence at their offices on Tuesday. Violence against women and children is an international phenomenon but in the Western Cape, it has reached pandemic proportions. Gender-Based Violence is a silent, insidious serpent that slices through all barriers of society. It is indiscriminate, it affects the young and old, the rich and poor, it pays no attention to race, social status, political affiliation or religion. 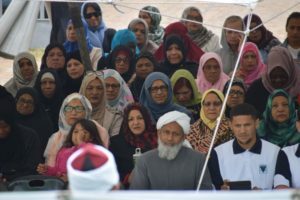 “Raising awareness, mobilizing, educating and empowering our masses about this pandemic, is the responsibility of every faith community,” MJC Women’s Forum Chairperson, Mualima Khadija Patel-Allie said. “We cannot remain silent, portray apathy, stand by and be complacent as the aggression perpetrated against our sisters and children intensifies and escalates. This atrocity is critically threatening the existence of healthy functioning societies in South Africa,” she continued. A recent report by the Medical Research Council found that 40% of men assault their partners daily and that three women in South Africa, are killed every day by their intimate partners. “We can only address GBV in society when we choose to identify and acknowledge the enormous impact it has on communities,” MJC Head of Social Development, Shaykh Faadhil Emandien said. All speakers at today’s event called for every South African to take a bold step and do their bit to stop the violence perpetrated against women and children in our society. “We encourage society to acknowledge that violence against women and children, is NOT a government problem or a criminal justice problem alone,” said Mualima Patel-Allie. “Gender-Based Violence is a societal problem which stems from poverty, lack of education and unemployment, amongst others. But to eradicate it this scourge, the solution lies with us,” she concluded.